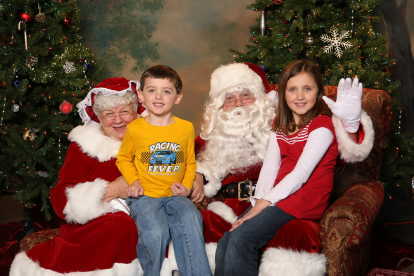 Santa & Mrs. Claus 2008 Visits!! 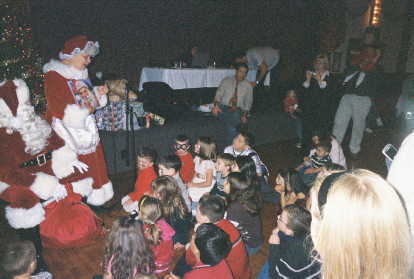 Dec. 6th - We visited a wonderful Christmas Party for the Ametex Aerospace & Defense employees in North Reading! 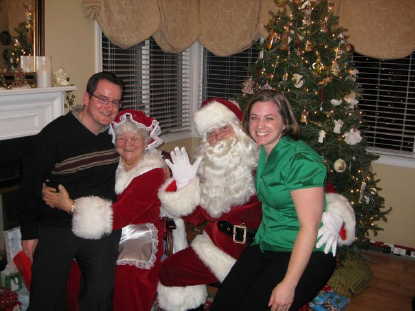 Dec. 6th - We also visited a Christmas Party for Citrix Systems employees and had a wonderful time! 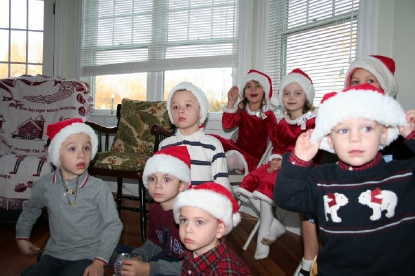 Dec. 7th - We visited the Chalmers family Christmas Party in West Roxbury! Dec. 7th - Then on to Dartmouth to visit Dan & Jen Good and family!! 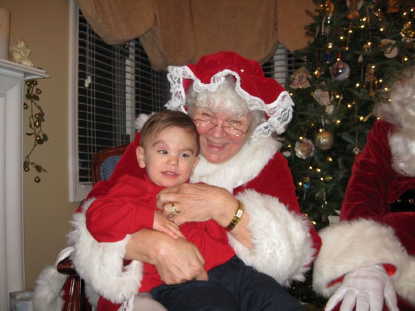 Dec. 13th - Mrs. Claus & I visited the KinderExpress Daycare Center, we loved those kids! 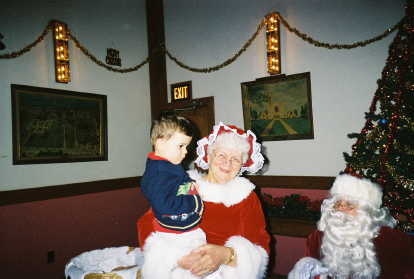 Dec. 13th - Then on to To Walpole to visit a nice family Christmas party! 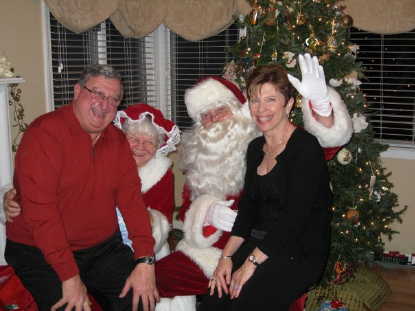 Dec. 13th - We went to Raynham to visit a great party given by Mark & Kim Dolan! Dec. 13th - Then on to Marlborough to visit with the children of New England Malayalee Association's Christmas Cellebration! 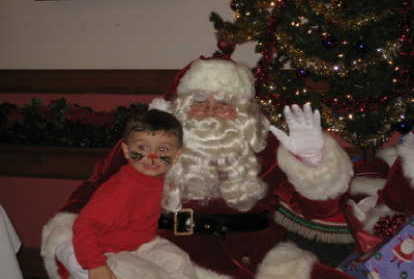 Dec. 14th - We went to The Abington Knights of Columbus for a "Breakfest with Santa". The people there were so wonderful! They had photographer Dan Doke there!! 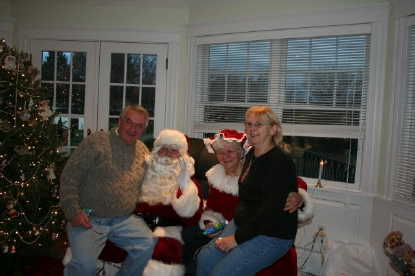 Dec. 14th - Then off to visit some great friends in Beverly, MA, Carole & Charlie Lundrigan and there big family! Love you all! and comfortable. Mrs. Claus is phenomenal!! You two are a perfect pair. I was so blessed to have found you. 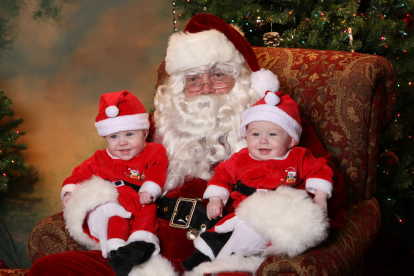 We look so forward to your visits and the kids excitement over seeing you is unbelievable. 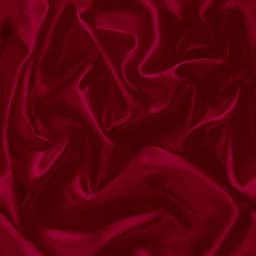 I am attaching a few pictures for the site. We have a few of the both of you that are awesome, but you already have great pictures of you on the site. Looking forward to next year!!! Hope you enjoyed the goodies. We were so happy that you took them. Felt good to give you something! ! Dec. 14th - We then went to Winchendon, MA to visit Laura Connell and her beautiful family! Thank goodness they had a generator!! Victums of "ICE STORM 2008"
Dec. 16th - Mrs. Claus & I visited a family in East Falmouth, MA. It was a sweet visit. 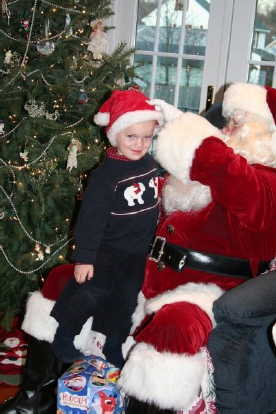 Dec. 17th - We visited Small Steps Day Care in Wrentham, MA What a nice enviroment for a child! 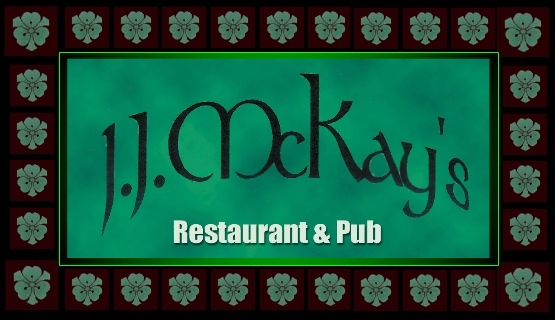 This restaurant is very homey and the staff are so friendly. This place has my recommendation! Dec. 20th - Then off to The Vikings Club in Briantree, MA to visit the DelPrete family!! It was a sweet visit, the children were so sweet! Dec. 20th - We then went to Duxbury, MA and had a wonderful visit with the DeLorenzo family! We had a great time! 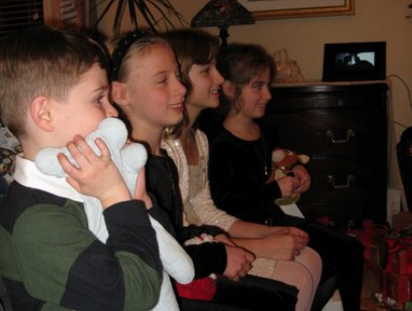 Dec. 20th - Then off we went to Mansfield, MA for a heart warming visit with the Borsari family. Nice folks! Dec. 20th - To the Florian Hall in Dorchester, MA we went! We gave a message to all there from George King, who couldn't be there. 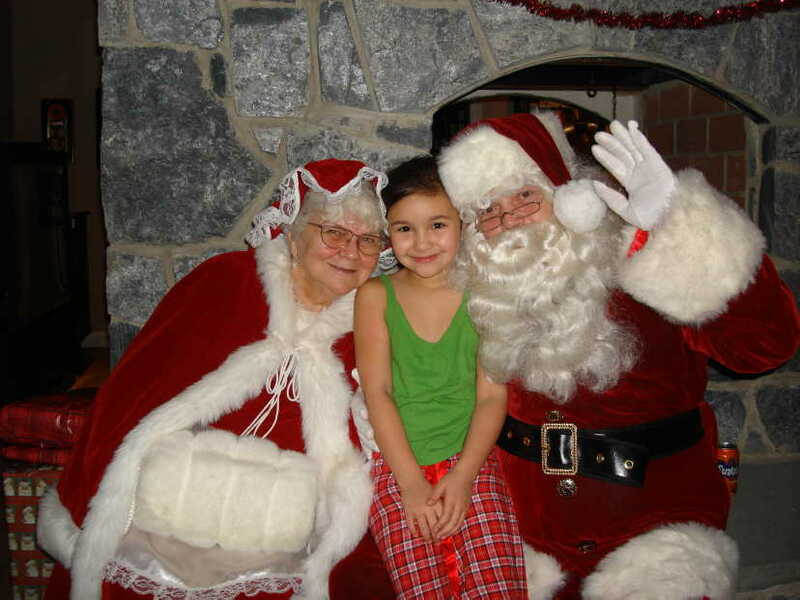 Mrs. Claus & I greeted everyone there!! God bless George King! 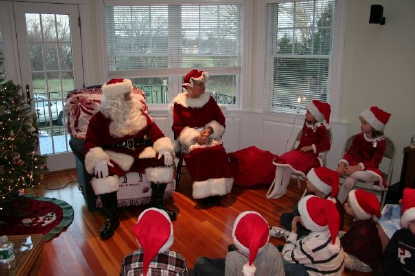 Dec. 20th - Mrs. Claus & I then went to Hanover, MA to visit some sweet children and also greeted everyone at this house Christmas Party! 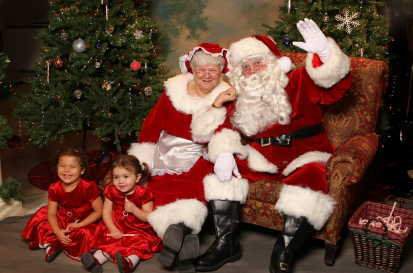 Dec. 21st - Mrs. Claus & I were honored by being a part of the Wakefield Music Boosters Club's "Polar Express". 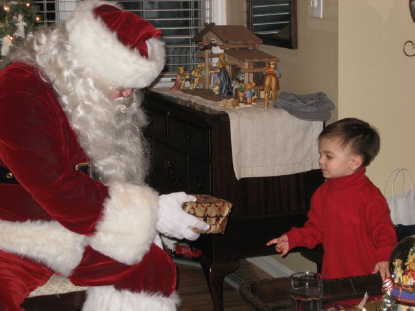 Join the Wakefield Music Boosters (WMB) on a fun-filled 70 minute train ride with Santa and his elves. 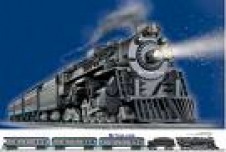 The WMB Polar Express will leave from Anderson Station in Woburn on an express route to the North Pole. The Polar Express," adapted from the award winning book of Chris Van Allsburg, will be performed by our special storytellers. special silver jingle bell of their own. This is a truly magical ride at Christmas for the kids and adults alike. PJs are welcome. Remember to bring your camera! have run into today. I hope we have the opportunity to work together again. I will certainly recommend you to others. Thanks for everything! Keep in touch. families from the Wooded Acres Child Care in Kingston, MA. This was held at The Knights of Columbus Hall in Kingston! 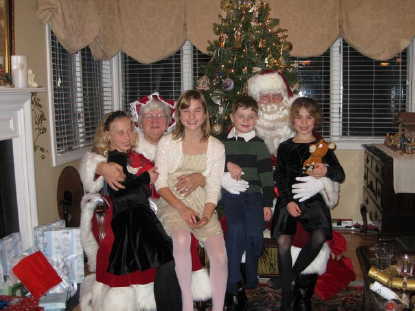 Our first visit this night was to a great family in Whitman,MA, who Mrs. Claus & I also visited last year. We greeted the family Then we read a story and sang songs with the children. It was great to see them again! Then to Holbrook, MA we went! This was a Home Visit to Christopher! He is only 2 years old and quite the character. He had everyone there smiling and laughing as they heard him talking to me. What a bright young boy! Up to Stoneham, MA we went to visit a nice family for there Christmas Family gathering. They were all so nice, and the children were excited to see us. We enjoyed our visit with them! Then over to Lynnfield, MA to visit with the Langone Family! 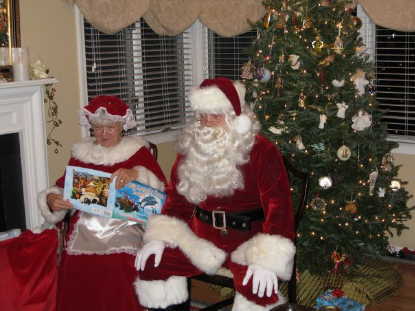 Mrs. Claus & I enjoyed reading a story to the children, the adults loved it just as much!! We sang a song together, it was fun. One of the children wants very badly to visit us at the North Pole!! Hope you are relaxing now that the holidays are over. 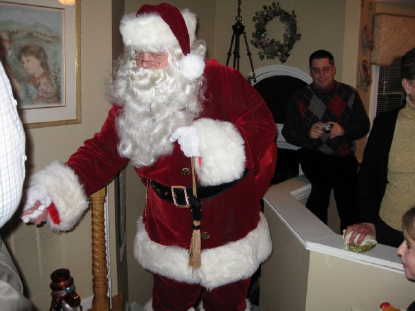 Thank you again for stopping by our family party on Christmas Eve. Everyone enjoyed your visit and we hope you will be able to come next year. We'll be in touch to reserve our spot much earlier this year! 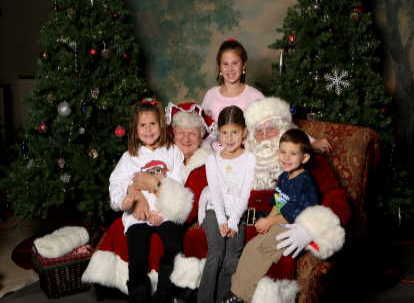 Then off to the North Pole Mrs. Claus & I went! The elfs had the sleigh all loaded with the toy's for all the boy's & girls and the reindeer were all harnested to the sleigh and ready to go! 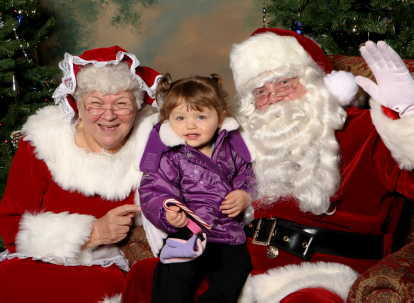 Mrs. Claus wanted to go with me on my first trip to see if she could see a special little girl in Windham, NH. I agreed, but told her I must bring her back after that trip so I could have her there to make sure all was fine at home and that I needed her there to get my hot chocolate ready for when I return from my delivering all the toys! 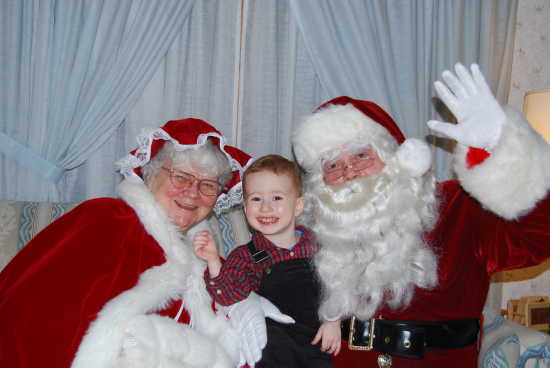 So, Mrs. Claus & I got into the sleigh with my bag of toys and 1st stop was to be in Windham, NH to see if Mrs. Claus & I could delivery some toys to a special girl there and to see if we could see her as she slept! 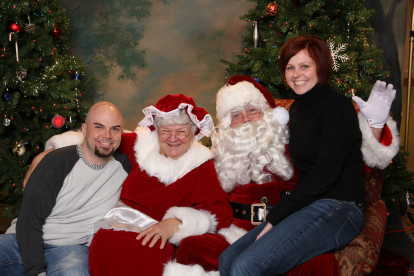 When we got there, I came down the chimney and had to unlock the door so Mrs. Claus could come in. I saw that there were many cookies and a big mug of milk left for me and 8 carrots for all my reindeer along with a bowl of water for them! That was so thoughtful! I then saw a letter to me! She asked if I had considered her list of things she wanted and wishing me a warm and safe trip that night. As I was reading this letter, I was eating one of the cookies she left and thought I heard something. I turned around and spotted her up in the hall overlooking the room I was in. She was with her parents watching me! I then asked if I had woken them and asked them to come down. 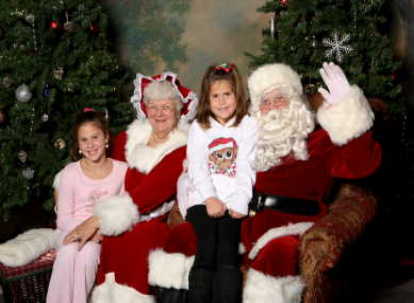 Her name was Skylar, she was shocked that she had saw me and Mrs. Claus and was caught by me as they watched. I thanked her for her letter and all the treats for the reindeer and myself, then I brought her over to the Christmas tree. I explained that I wanted to give her a couple things, but before I finished putting out all the gifts for her, she would have to go back to bed as I finished my work. I then pulled a suitcase from my sack that she had asked for, she was delighted, but didn't say a word. Then I asked her "If you could only ask me for one thing, what would it be?". Skylar said, "A WII". I nodded and turned to my sack again and pulled out a wrapped box and held it in my hands. Skylar unwrapped it as I held it. As she pulled off the wrapping paper she saw it was indeed a WII game!! She was so thrilled!! 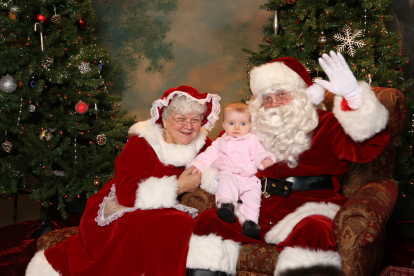 She then went over to speak to Mrs. Claus as Mrs. Claus had been wanting to speak with her. 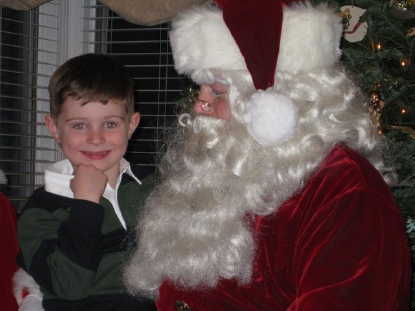 I then sat down beside Mrs. Claus as she was talking to her. I then lifted Skylar up and placed her on my lap and had our private chat. She was so sweet. I then explained to her that it was time for her to go back to bed so I could finish my work there and thanked her for all the treats she had left for the reindeer and myself, gave her a hug and off she went. 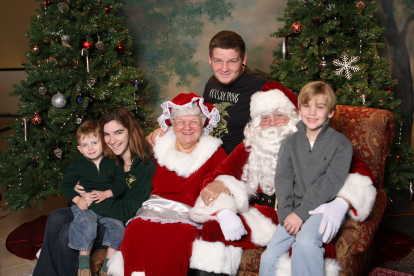 It was a geat visit for Mrs. Claus & myself! Then off to the North Pole we went to drop off Mrs. Claus. I then took-off to deliver the rest of the toys. It was a wonderful night! We can't wait till next year! It was fantastic!! She still can't believe it. She brags about it to everyone. Thank u for bringing her dreams to reality! She will retain this memory forever and maybe do it for her kids one day.